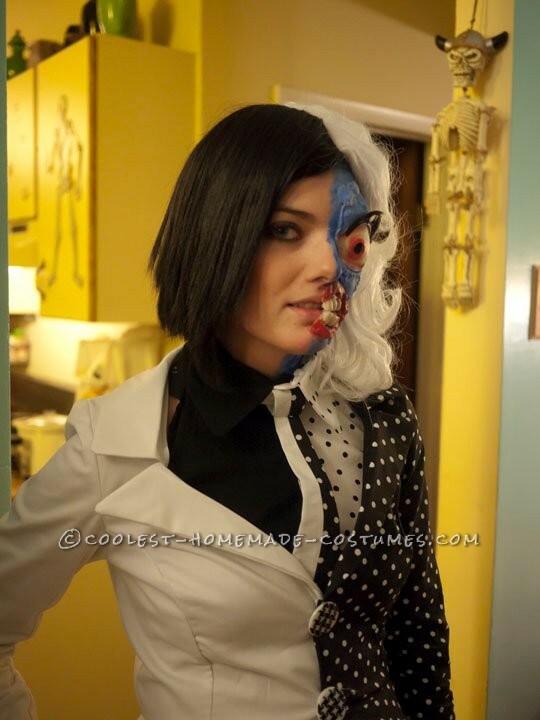 I’d been wanting to do my own version of Two Face from Batman: The Animated Series for about 6 years now. However, I wanted to do my own take on the character. I love polka dots so I KNEW I had to make this costume my own. I used commercial patterns and instead of cutting two of everything, I cut one piece from each fabric but reversed it so I could get the split effect. I used an inverted polka dot to do the layers of the jacked up side of the costume, alternating between black with white polka dots and white with black polka dots. I even committed with polka dot thigh highs and heels! I had some leftover blue liquid spandex from another costume that I used to cover my leg on what was to be the mutated side of my body. The face makeup is a combination of nose wax, latex, bubba teeth that I snapped in half, and a latex bug eye prosthetic I found a local costume shop. 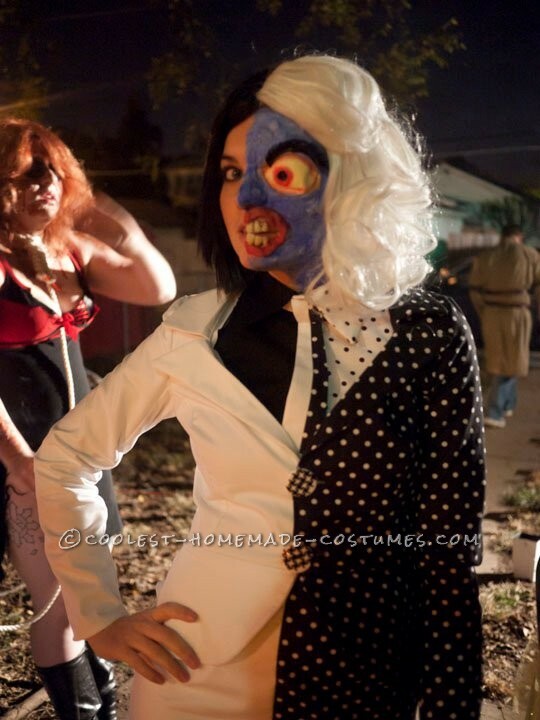 My face was lacquered in spirit gum! I used Ben Nye liquid makeup and a ridiculous set of eyelashes to do the eyebrow. I bought two different wigs and sewed them together for the awesome split wig. The reaction I got from this costume was amazing. Everyone loved it! I’ve worn it to multiple events. It was the first time I had done a “not so pretty looking” costume and have since continued that trend with my latest Halloween costumes. I love how my vision became reality!